Ta'Illistim, also known as the Shining City, is a city-state situated in the foothills east of the Dragonspine Mountains. It is one of the five major states that comprise the Elven Nations. 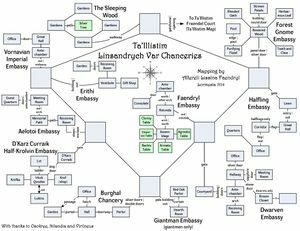 Founded in the year -49,107 by Linsandrych Illistim, the city is the seat of power of the House of Illistim and remains one of the foremost centers of scholarship on Elanith. It is presently ruled by Argent Mirror Myasara. The great city of the elves shines like a beacon throughout the eastern continent of Elanith. A place of legend, magic, music and wonder are the lifeblood of the city and adventure lies within and without. Of special note are the grand beauty of the hanging garden dais and the impressive must-see airship port. Some of the elven locals are less than thrilled with the increased traffic that the new trade routes have created, preferring a simpler steady culture. Hanging Gardens - The floating dais in the southeastern portion of the city is a traditional adventurer's gathering spot. Hall of Patrons - Town cleric. 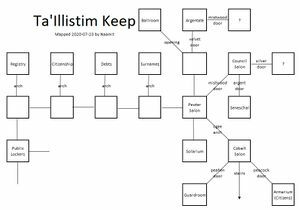 Ta'Illistim Keep - Government, debts and citizenship clerks, public lockers. For the full list of city shops including temporary merchants, see Ta'Illistim Shops. For proper behavior around the Illistim nobility, see Protocol and Etiquette: Behavior Within the Court of the Illistimi Elves. The following storyline NPCs were provided by GM Valyrka in July 2016. Ardtin Greyvael active during formal court events She is a member of the Council of Thrones. She is elderly, as far as elves go, and has a strong sense of propriety. She has a fondness for glimaerstones. She is a former Argent Mirror. She encouraged Myasara to marry and then to hand over control of Ta'Illistim to the council while in mourning. Caylio Javilerre dead He is a Teacher of Lore, with a focus on the archaeology of the Arkati. He prefers to be in the field, rather than in an office or lecture hall. He died at the hands of an assassin hired by his sister Hycinthia immediately after his wedding vows to the Mirror were recited. his death was an accident. Clessar Ryvvuel active Chalat Greyvael's apprentice. Gelynne Greyvael active Niece to Chalat, orphaned and came to live with him. Talented jeweler. Hyacinthia dead Tried to assassinate Argent Mirror Myasara. She murdered her brother Caylio in prime. Her father Commander Murstyr beheaded her at the command of the Mirror. Nessina Javilerre infrequent Former handmaiden to the Mirror, all handmaidens were dismissed. Nualina Greyvael infrequent Former handmaiden to the Mirror, all handmaidens were dismissed. Tanyela Chesylrae infrequent Former handmaiden to the Mirror, all handmaidens were dismissed. 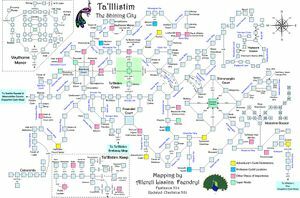 Ta'Illistim, the legendary home of the elves, plays host to many things magical and mysterious. 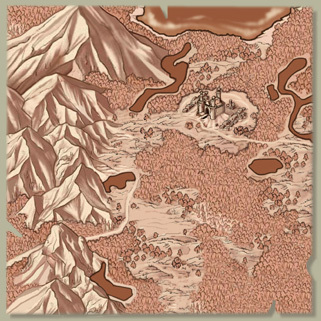 It has remained cut off from the western world for many years and has only now begun to reestablish ties though the recently forged trail across the western Dragonspine. Despite being a great beacon of civilization, dangers lurk within the forests and wilds nearby. Descending from the high ridge of Zhindel's Post, Whistler's Pass begins as a rock-strewn, arid region blasted by chill mountain gusts and enclosed by high walls of sheer stone. The denizens of the Pass scurry among the crevices lining the rock walls, foraging a meager existence from thorn bushes and cacti. Utilized by both Elves and Dwarves alike, Whistler's Pass is a vital trade route through the Dragonspine Mountains and provides access to the Elven city of Ta'Illistim from the harbor town of Wehnimer's Landing. Points of Interest: Travelers report hearing echoes resound through the middle section of the pass. Seek out the high mountain ledges and try out your yodeling skills! The main route of travel between the shimmering blue spires of the Ta'Illistim, the hamlet of Sylvarraend and the great city of Ta'Vaalor. Adventurers will find several connecting trails off the road that lead to the local challenges of the wild while more common travelers should stick to the main road. Wonderfully lush grasslands rest just beyond the forested valley of Yegharren. Nature was blooming at its very best when it created this miraculous combination of life and land. The weather tends to remain temperate and calm despite the harsher northern environments not far away to the northwest. Rumors: Danger lies beyond the veil of beauty. Take heed. Not all things in nature are as friendly as they are beautiful. Though the lands are quite inviting, the orcs of Orcswold are not so. Travelers should take care when near the village for the orcs are crafty. They feed the wild dogs and boars making them wayward allies in their quest to survive. Rumors: Smart travelers can avoid this place by keeping an eye out for feather and wood totems, common orc talismans, which are often hung from the trees near the village. Located at the edge of the lush valley of Ta'Illistim, the Masked Hills are a prime example of how the harsh and the pristine can coexist in beautiful natural harmony. At the base of the foothills, the lush Emerald Forest is budding with life and is a popular destination for hunters and gatherers of all types. Game animals and vegatation are abundant, and it is within a short distance from the safety of Ta'Illistim. Further up the foothills, the vegatation slowly gives way to the harsh beauty of the Gorget Trails, with its breath-taking views of the lush valley below and its glimpses of the majestically imposing rock spires of the upper mountains. These rock spires, pounded out of the mountains by the unceasing gales of the upper regions, are true testament to awesomely destructive, yet creative power of nature. Points of Interest: Emerald Forest, Gorget Trails. Rumors: Although the region is a testament to nature's power, a mysterious dark temple rumored to be located near the Masked Hills appears to draw visitors based on the all-too-mortal power of greed. The stunning beauty of the great coniferous trees in this region is reason enough to visit this far away nature haven. With young yew, haon and the distinctive sap of the tanik, one can easily get lost in the endless wonders and peaceful harmony of the land. Rumors: Nature isn't always so kind. Travelers should watch our for trolls and other forest creatures when visiting. Few adventurers dare to travel within the dark and strangely quiet forest known as Wraithenmist. North of the Sylvarraend Road and not far from Ta'Illistim, the forest reaches northward to the banks of the Lake of Shadowed Sorrows. Here within the mists and moss, even the lowly lichen becomes a threat along with the echoes of what once was. Rumors: Long past, a dark and spiteful evil touched the forest and it was forever cursed with shadow. Isolated and desolate, the Black Moor lies well beyond the well-marked paths of Sylvarraend. Travel to the area requires passage through the rough ravine that cuts through the Yegharren Plain like a giant wound in the landscape. Vegetation beyond the gash is rare and often shrivelled, while decaying ruins litter the area, resulting in a sickly, skeletal appearance that gives the Black Moor its name. Points of Interest: According to rumor, a gruesome shrine of bone lies deep in the moors, haunted by all manner of foul beasts. Rumors: The remains of a great battle scar the landscape and it is said that the souls of its victims still haunt the land. Travellers are strongly encouraged to seek the aid of a cleric before venturing into this cursed and blackened land. The remnants of an ancient outpost stand silent vigil in this forest of tall black oaks and ash trees. Once home to an enclave of elven rangers, the outpost and the surrounding woods were polluted by ill-begotten magic, corrupting the local well and making the once-stately oaks brittle and lifeless. Even as the tree-homes of the outpost began to fall, the indigenous wood sprites, once playful and friendly, became crazed and filled with malicious intent. Joined by the monstrous tusked ursian and shadowy forest bendith, the sprites drove the last of the rangers from their home, leaving only decaying huts and a befouled well as testament to their once-proud guild. Located high in the rocky foothills behind Ta'Illistim, Seethe Naedal is a hiker's dream come true. Accesible only via a rough hiking trail that winds its way up the thickly treed rocky crags, the upper lookout points are often only visited by intrepid rangers and other nature lovers. However, all travellers to Ta'Illistim should take in the splendid panaramic views of city and its lush home valley that Seethe Naedal offers. Rumors: According to local lore, the hot springs nestled in the cracks of the foothills can cause even the weariest of souls to forget the burdens of everyday life and appreciate the simple joys of rest and relaxation. Known as Gyldemar Green, this southwest corner of Gyldemar Forest is home to a large variety of flora and fauna. An assortment of wildlife populates the area, from the harmless to the deadly. Beaver and trout make their homes in a brook that meanders through the eastern section of Gyldemar Green, while raptors and leopards seek their prey. A large waterfall cascades down from the north, filling a pool and feeding a brook to its south. Northern half of the Green is hillier and the trees are mostly coniferous, while to the south the foliage is more deciduous. Rumors: Many rumors surround the now deserted Calelith Villa. Of most concern to anyone travelling through this area, is the rumor that whatever happened here before could happen again. Not far west of Whistler's Pass lies a mountain trail and valley covered in glacial ice. At first glance, you might believe they named this harsh frozen valley 'Gossamer' because it's anything but. However, with careful observation, the truth of it becomes clear that they were referring to the delicate and tenuous grasp of life that manages to cling to unforgiving land. Rumors: Not all of the ice around the valley can be trusted to sit still and stay cold. Creatures in the form of ice and slush threaten travelers almost as much as the weather. Dark and twisted, the Blighted Forest welcomes no one and few find reason to seek it out. Consumed by black branches, brambles and all manner of wooden obstructions, it is generally more of a challenge to move ten feet without encountering some obstacle than it is to survive the deadly vipers and ogres that make their home within. Rumors: The elves of old were said to banish criminals to this forest instead of jail them. Modern times have seen an end to such a cruel punishment. Rising like fingers reaching into the sky high above Ta'Illistim are the four towering peaks of Griffin's Keen. Named for the monstrous flying beasts that call its icy slopes home, Griffin's Keen can safely be called one of the most dangerous places in all of Eastern Elanith. Icy footholds abound and have sent many an experienced rockclimber to their untimely demise. Those who manage to reach the peaks find little but angry griffins in their nests and the remains of those who came before them. Travel to this region is strongly discouraged for all but the most powerful of adventurers. Points of Interest: Onyx Point, Ruby Point, Emerald Point, and Topaz Point. Rumors: A strange magical field is said to exist amongst the peaks of Griffin's Keen. Magical wards fail often, survivors say, and one should not depend on consistent magical protection when climbing the peaks. This page was last modified on 1 August 2017, at 14:20.